A resolution that was passed by the Waldron City Council earlier this year on an Arkansas Department of Transportation partnership is still the subject of controversy. 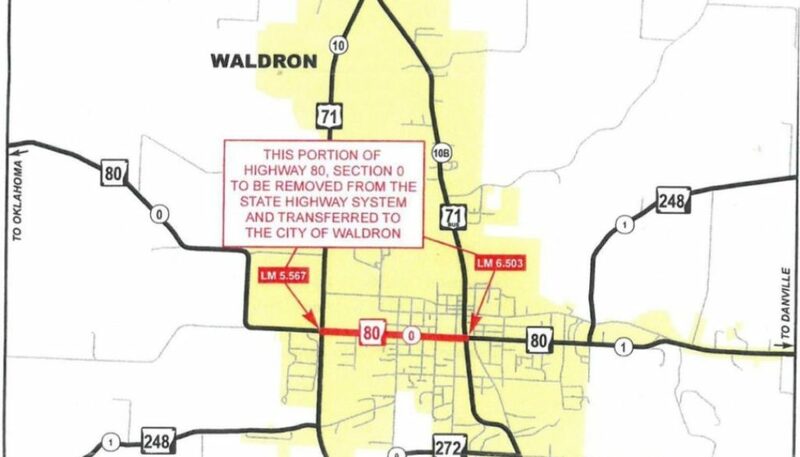 The city council passed a resolution Aug. 14 expressing Waldron’s willingness to partner with the Arkansas Department of Transportation to obtain a new “access break” between Arkansas 80 and Second Street. The resolution states this access will enhance economic development in the city. With the resolution, Waldron agrees to accept ownership and responsibility for the portion of Arkansas 80 between U.S. 71 and U.S. 71B upon completion of improvements to U.S. 71 and Arkansas 80. ArDOT agrees to make improvements to U.S. 71 and accommodate the break in access, as well as provide an overlay of the portion of Arkansas 80 to be transferred to the city. 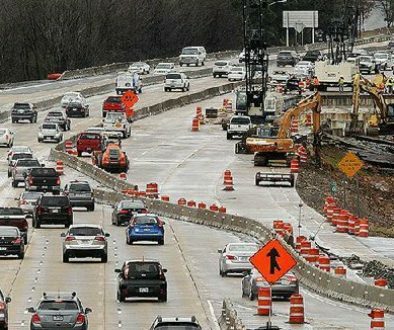 The improvements will be contingent upon the concurrence of the Federal Highway Administration, and the department of transportation will cover all costs and handle all phases of the project. Waldron Mayor Neil Cherry said this is a break in access to develop property should it ever be sold and this will give Waldron access to the property. “Now, if the property is never sold, if it’s never developed, the access will never be put in, and that’s it,” Cherry said. Cherry also noted the property is owned by Harps Food Stores, which has shown an interest in selling it. “The contractor, whoever buys the property for retail establishment, whatever type of business it is, he will be responsible for building the street, laying the sewer lines, laying the water lines, and then at that point, Arkansas Highway Department will come in and build the access and put the turn lanes in,” Cherry said. The portion of Arkansas 80 between U.S. 71 and U.S. 71B, which the city would accept ownership and responsibility for, is about 1 mile in length. An agreement of understanding between Waldron and ArDOT regarding the break in access states that upon completion of the project the city will provide a copy of its master street plan to the department depicting the proposed infrastructure improvements. These should include the location of the requested connection to U.S. 71. The city will also provide a copy of the platted street and of the city ordinance adopting the new infrastructure improvements, as well as comply with other requirements. 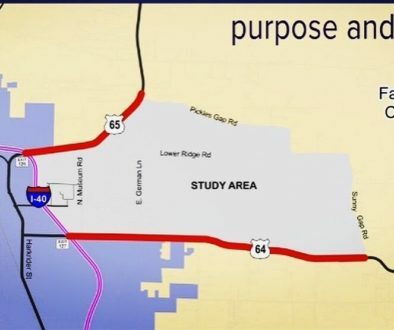 The agreement also states ArDOT will be responsible for all design, environmental documentation, right-of-way acquisition and utility relocation for the projects. The state is in charge of advertising, awarding and performing construction inspection for the project. Waldron City Clerk and Treasurer Sherry Johnston said the U.S. 71 bypass around Waldron was constructed in the early 1970s. This has limited access. Waldron has areas there that want to be developed commercially, Johnston said. Johnston said where the McDonald’s and the Charbroiler Restaurant are in Waldron there are several businesses that use that one access. The traffic there is heavy in the mornings due to the lack of access, so it has created safety issues and economic development problems for the city. Johnston said Cherry has worked diligently for this access approval off the bypass. However, the resolution the city council passed has not been without its critics. Waldron Resident Sharron Goodner said taxpayers in the city will have to fund the maintenance of that portion of Arkansas 80. The closing of the Walmart in Waldron took place July 2017. Goodner provided a photocopied letter dated Aug. 10 written to Cherry in which J. Max Van Hoose, vice president of store planning for Harps, states Harps is interested in selling its Waldron property for retail growth as long as the retailer does not sell groceries or other items that compete with its main business. This includes, but is not limited to, conventional grocery stores, fuel stations, pharmacies and dollar stores. Scott County Resident Nick Mulchin said the resolution also gives the Waldron mayor the right to sign all contracts connected with the project. Section II of the resolution states the mayor, or his designated representative, is authorized and directed to execute all appropriate agreements and contracts necessary to expedite the construction of the project. The resolution was presented rapidly at an organizational meeting a week before the August city council meeting, Mulchin said. It is his understanding that the members of the Waldron City Council did not have much time to deal with it. Lanis Harwell, a member of the Waldron City Council, said three council members voted for the resolution while another three voted against it. Cherry broke the tie. Harwell said normally the city council would take something of this importance and table it for possibly two or three months. That is what is advised by the Arkansas Municipal League, to not rush into things of this importance, Harwell added. “They’re going by what the mayor, a couple of people are saying that this is a good thing, and so … three voted it in, three voted negative, and even with that, we were hopeful that the mayor would just back up a little and let us have time to talk to the … highway commission just to get further information from them personally rather than hearsay,” Harwell said. When asked about these criticisms, Cherry and Johnston offered their rebuttals. In regards to the letter expressing Harps’ limitations on what kind of retailer can purchase its Waldron property, Cherry said stores that fall within these limitations include dry good, clothing and furniture stores. He also said Dollar Tree was interested in the property at one time, although he does not know if that is still the case. “But there’s several different retail businesses that we would like to see go there,” Cherry said. The city is also open to the possibility of the Harps property being sold to a manufacturer instead of a retailer, Johnston said. Cherry said he believes after the purchase and development of the Harps property, the revenue that would be generated by the businesses there would more than offset the expense of Waldron maintaining that portion of Arkansas 80. In addition, the more retail business Waldron can attract, the more Waldron residents will be able to stay at home and do their shopping there. 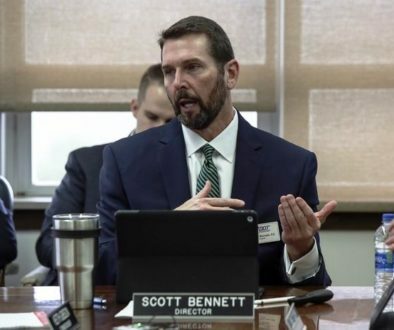 “Plus, going by the state of Arkansas, they say retail growth develops industrial growth, and so if we can get retail growth in here, we can have a better chance of bringing more industrial growth to Waldron,” Cherry said. Johnston said the city of Waldron did a trade with the ArDOT almost 20 years ago in which the city took over an almost 2-mile section of highway that joins this section of Arkansas 80. This was Arkansas 248 West, and the city has spent no money on it during this time. “When the city does take ownership of this Highway 80 … sometime in the future, they’re going to resurface it to state standards, so we will receive it in excellent condition, and some point in the future, we’ll have to do some maintenance and repair, but we will not have to resurface the whole thing at one time,” Johnston said. The state, Johnston adds, has adopted a program that extends the useful life of an overlay. In regards to the criticism concerning section II of the resolution, Johnston said the department of transportation wrote the resolution. She believes it implies that the mayor could not only sign the resolution, but also any other items that came forward. Cherry said the resolution was presented during a city council planning meeting on Aug. 9, almost a week before the Aug. 14 city council meeting. Johnston said the mayor provides a brief update on city services and activities at every regular city council meeting. “And I won’t say at every meeting, but … very often, the mayor continually kept the council updated on this issue because it’s of great concern to our community, so it’s not like it just fell out of the sky one day,” Johnston said. In speaking why he broke the tie to pass the resolution at the Aug. 14 meeting, Cherry said it would not have mattered to him when it was passed. Johnston said Harwell entered a motion to approve a resolution rescinding the original resolution during the October Waldron City Council meeting, but it died for a lack of a second.